There are two articles, the ‘indefinite’ (= a/an) and the ‘definite’ (= the). The ‘indefinite article’ is a, sometimes an before a vowel. 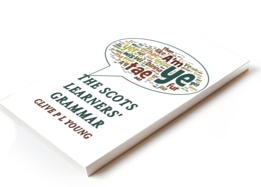 Gie’s a aipple or Gie’s an aipple are equally correct and the former is particularly common in spoken Scots. The plural is some, as in English. Some fowk niver lairn. Ae and the older form Ane is used before a noun is an adjective, emphasising ‘one-ness’. As in English, the Scots ‘definite article’ is the. There are some dialect variants; e or ee in Northern dialects, da in Shetland and tha in Ulster-Scots. The it is used much more in Scots, e.g. before times, institutions, trades, branches of knowledge, languages, family members, diseases, seasons, pastimes, days, means of public transport, body parts and sometimes instead of possessive adjectives. There is perhaps an analogy in some of these uses with Scottish Gaelic e.g. an-diugh (today) is literally ‘the-day’. Keep the heid! Stay calm!